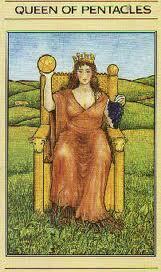 Apple River Tarot Readings - It's Not The Destination, It's The Journey: The Queen of Pentacles - Who's Happy? I'd love to be or even feel like the Queen of Pentacles today but I'm not sure I'm any where near feeling like her right now. Oh sure on an intellectual level, I really identify with all her glorious attributes and I aspire to them daily. She's stead fast, possessing endurance and stability, grounded within herself and through her deep connection with the earth she loves to generously share in it's bounty, in any way that she can. She lives each day to the fullest and is the embodiment of what it means to embrace all the simple pleasures of life. The Queen of Pentacles very much is an inspiration and is really the quintessential Earth Mother, the image of feminine strength and sensuality, with dignity and power. I've deemed her to be the Queen of Hygge, and so drawing her today, is a much needed reminder for me to be happy, which is directly proportional to the gratitude I try mindfully to have everyday. Today it's been hard for me to focus on my gratitude because of the direct or indirect affects of not having enough available funds to get by every month. Yes, I'm poor, but I do know I'm rich, in so many other ways and this is what I try hard to focus on. Financial insecurity has been an ongoing thing for me and tends to wear on you after many years. I never thought I'd be wishing for the day I turn 65, in 508 days, but who's counting? Well I am, because this will make a huge difference in decreasing my stress level, when my income will increase three times. Today I've acknowledged that I'm sick and tried of struggling financially but I know there's light at the end of the tunnel and feel comforted by the Queen of Hygge who reminds me of this, and to count my blessings and to be thankful for the small miracles in my life. So the Queen of Pentacles (Omphale) queen of Lydia, she has made me grateful today and I'm feeling happier for it now, before having written this post about my favourite influential, down to earth, motherly Queen. I'm reminded of a saying that I try hard to live by. I'm grateful not because I'm happy, but I'm happy because I'm grateful. My cat Tommy Tom, he's a good teacher, he's so happy. He's really got this Hygge thing down pat! Tommy Tom is Hyyge enlightened! First a big sisterly Hug! Isn't it wonderful how such a tiny picture of a queen on a throne can shift your perception on your situation like that! I've encountered this phenomena so many times. I have had financial setbacks and yes also windfalls throughout my life but all this has taught me that nothing is sure and nothing lasts forever. 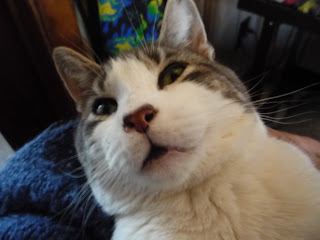 I hope you will keep you chin up and remember to play with you lovely cat when your fed up with it all. Thank you so much Ellen <3. You sure are right! I felt pretty low down yesterday until I drew this card and worked through my feelings and thoughts. Then my perceived burden sure seemed to lessen. Definitely nothing last forever. My mother always said you can only go down so far and then things you have to start turning around and going back up. It's an exercise in patience and I can always benefit from that lesson! I'm just having a hard month but it will soon be the end of the month and Spring is on it's way! :) Thank you Ellen and a great big sisterly hug back!! !